Jamal Barrow, a protégé of Sean 'P. Diddy' Combs, posed for this New York State Department of Correctional Services mug shot in April 2002. 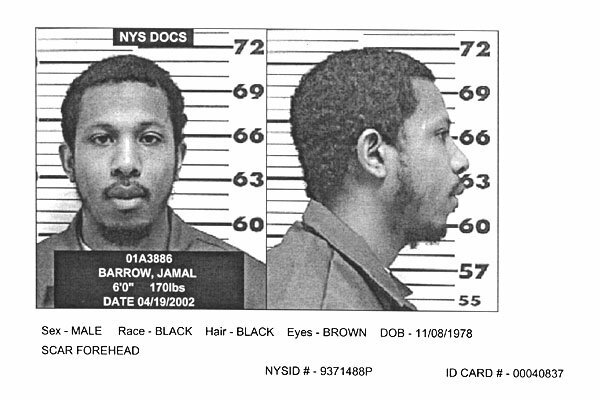 The rapper, also know as Shyne, was sentenced to 10 years in prison after being found guilty of assault, gun possession, and reckless endangerment in connection with a December 1999 shooting in a New York City nightclub. Combs, a Barrows codefendant, was acquitted of weapons charges during that Manhattan trial. Currently locked up in the Clinton Correctional Facility, Barrow is not eligible for parole until 2009. Submitted by franktherabbit on Mon, 2010-11-29 13:40.